See our favoritism disclaimer toward the bottom. 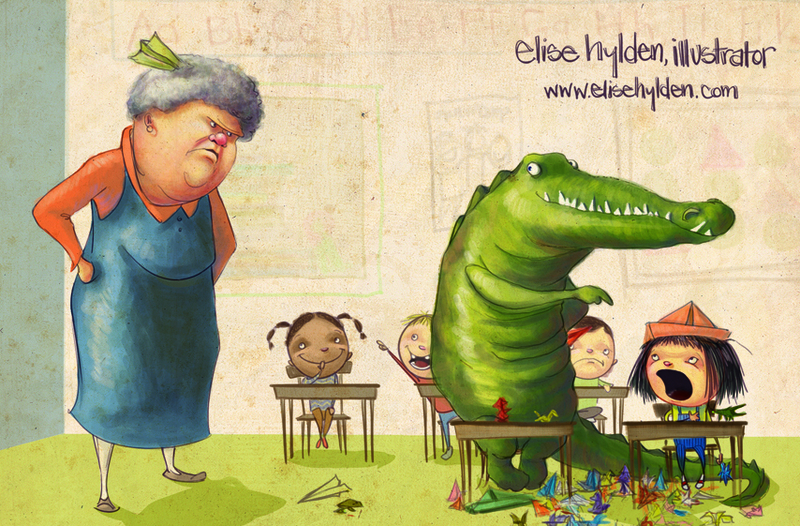 If you bring an alligator anyway, she’ll tell you that alligators are trouble! 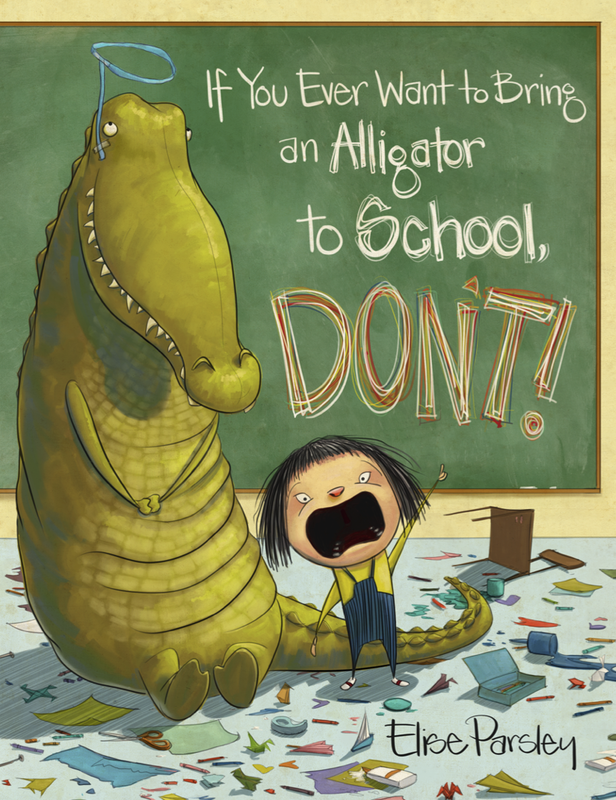 ~ IF YOU EVER WANT TO BRING AN ALLIGATOR TO SCHOOL, DON’T! If you ever want to cry, DON’T read this book! It’s hilarious. Parsley’s acutely aware of the funny bone and has created a main character, Magnolia, that can manage all of her illustrative wit. 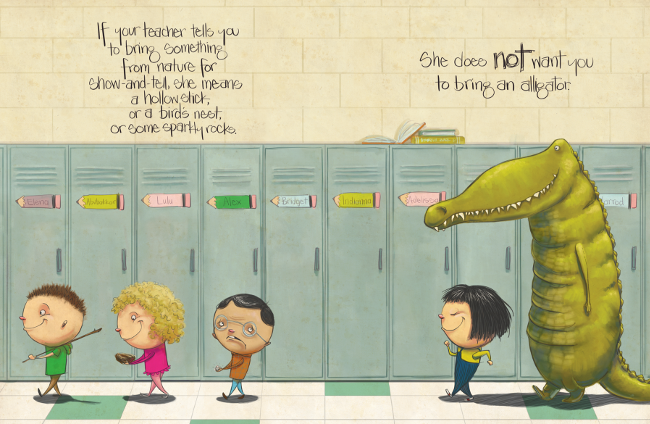 The delightfully adventurous Magnolia all but grabs your hand as she ventures into unknown waters by bringing an alligator to school for show and tell. 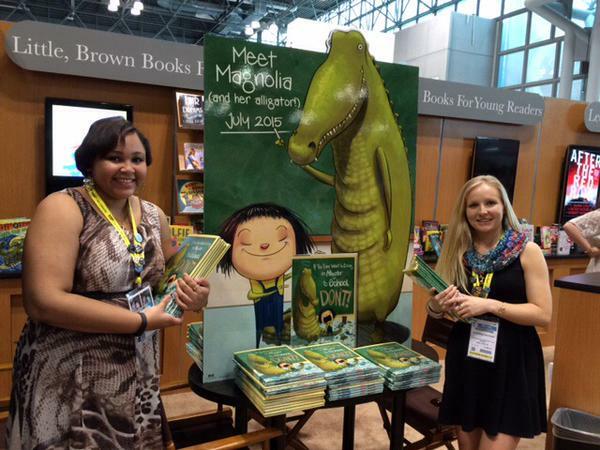 You will wish you were in Magnolia’s classroom, so you too, could join in on the fun. Parsley’s attention to detail shines in every pixel of her artwork as she pokes fun at the school day rituals. You will find yourself poring over every illustrated page of this frank narrative time and again, unless of course, you get gobbled up! Yeah, if you ever want to cry yourself to sleep, DON’T turn the pages of this book. By now, of course, you’ll wish you’d brought a hollow stick or a bird’s nest or some sparkly rocks for show-and-tell instead of an alligator. By now, you’d rather have some dirt than an alligator. IF YOU EVER WANT TO BRING AN ALLIGATOR TO SCHOOL, DON’T! 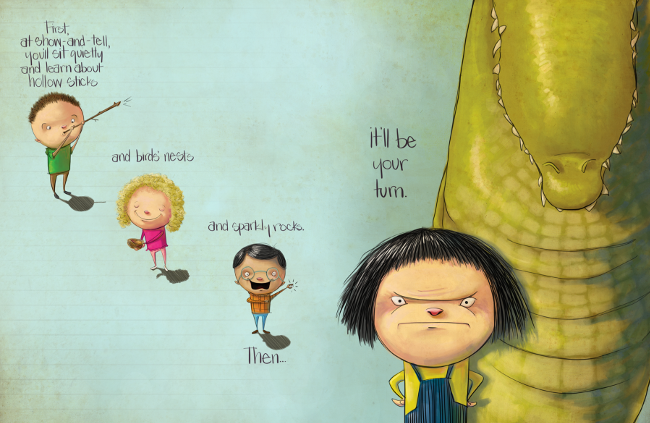 Magnolia and her alligator never get old. That’s because their creator, Elise Parsley, made them so darn funny. 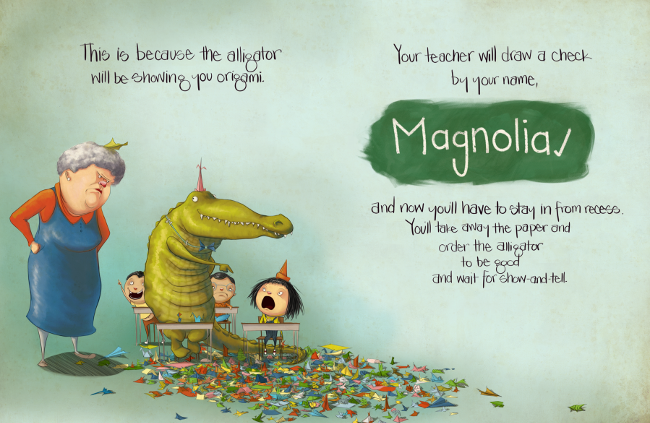 As you turn the pages, follow the paper airplane; admire the colors, textures, and shadowing; read the names on the lockers and the facts on the blackboard; notice the classroom diversity, giggle at the alligator’s shenanigans; and count Magnolia’s teeth. You might accidentally learn something. I sure did. Like the paint on page thirteen, Parsley mixes humor, mischief, and a dangerous supporting character with the universal school theme and stirs it to a satisfying circular end. Haven’t we all experienced the anxiety of show-and-tell? Haven’t we all feared that teacher? 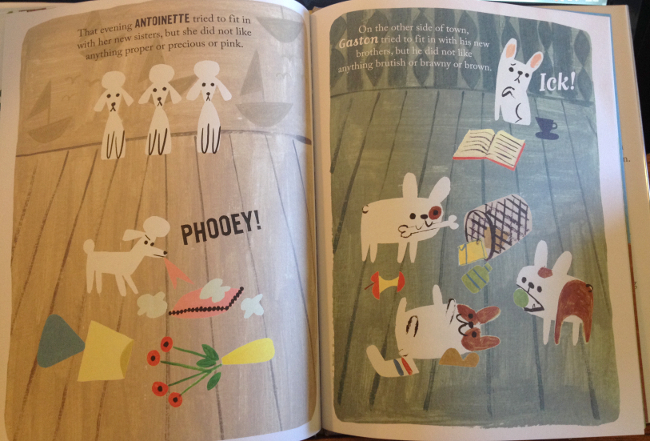 Everything you see is a part of Parsley’s charming life and imagination. She even designed the complementary font. That’s why we think she’s the bomb. And that’s why we know you’ll love this book. Anyone who disagrees deserves three checks by their name and an underline. Really, this was everyone’s Gem, but Kristi’s a better arm wrestler. DISCLAIMER: YOU COULD EXPECT A HOLLOW STICK, A BIRD’S NEST, AND SPARKLY ROCKS FROM THIS RECOMMENDATION, BUT NOT IMPARTIALITY. Not from us. We’re too invested. You see, we’re Elise’s critique partners–and we love her character creations like they were family. That makes us their crazy aunts, of sorts. Who doesn’t secretly love the mischief-maker? Take her soon-to-be firstborn, Magnolia, for instance. We’ve been with Elise since Magnolia’s conception. Okay, maybe that sounds a little weird, but If You Ever Want To Bring An Alligator started with a funny picture–one not quite as polished as the postcard version above, but almost. 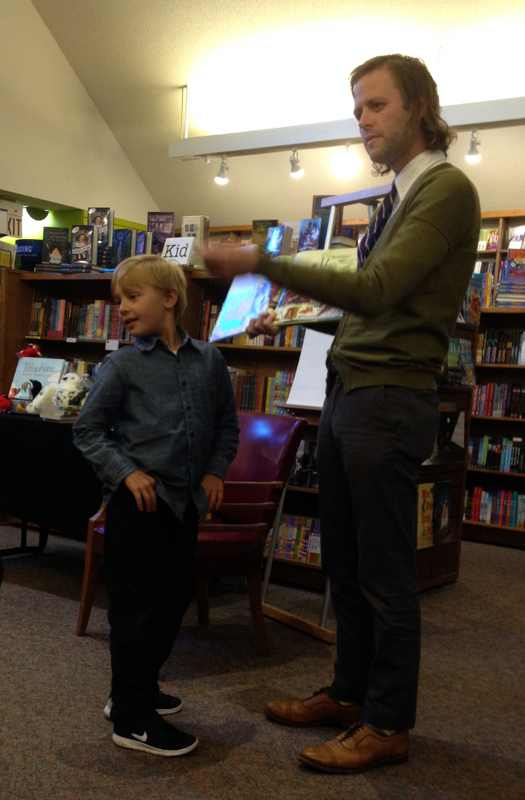 It made us snort and say, “This is a great seed for a picture book.” That was the non-steamy conception. Following this stage we fed Elise popcorn to appease her quirky “with child/character” cravings. We monitored Magnolia’s embryonic stages of revisions, queries, and conferences. 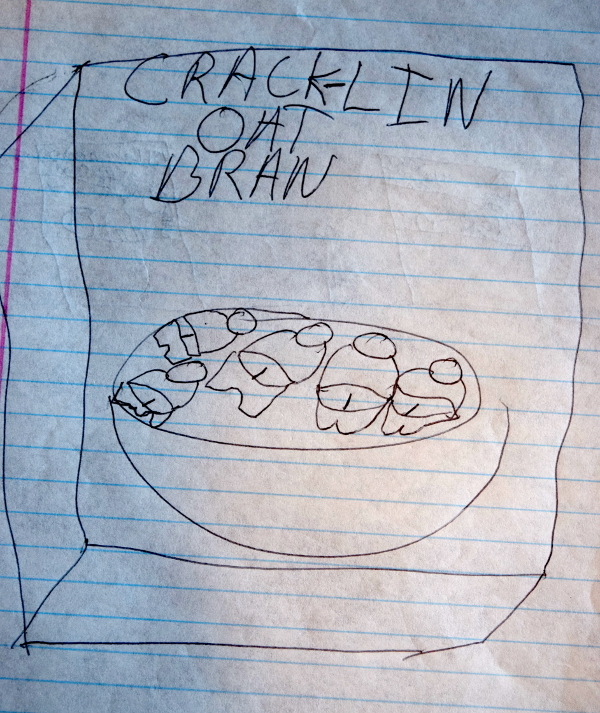 Then, we heard Magnolia’s heartbeat when an editor at the Fall 2013 Iowa SCBWI Conference told Elise that she had a breakout character. We held Elise’s hand during her labor pains, when she queried Steven Malk of Writers House. And we held a baby shower when Mr. Malk offered representation and got her the amazing three-book deal with Little, Brown & Company. And now we pace the floor, anticipating Magnolia’s birth. (You’ve probably surmised: It’s a girl! Oh–and an alligator.) 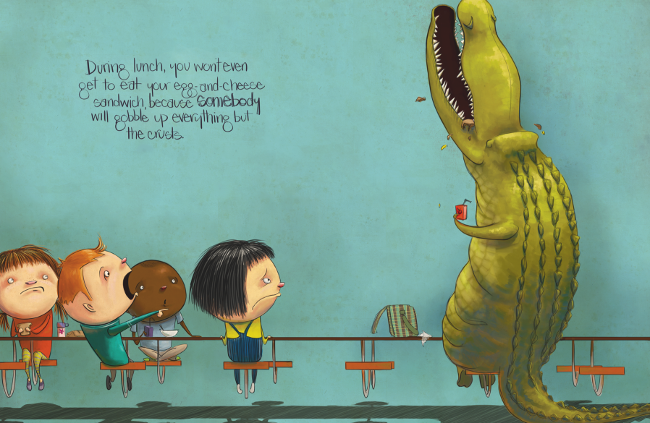 Elise’s IF YOU EVER WANT TO BRING AND ALLIGATOR TO SCHOOL, DON’T debuts July 7. We can’t wait until Elise introduces you to our feisty new niece. Watch for Anna’s gem next week! What is your favorite children’s book featuring a cold-blooded vertebrate? June is our month to honor our fathers. What children’s book makes you think of your dad? With June honoring fathers, let The Emperor’s Egg serve as a shout-out to all those single dads, stay-at-home fathers, and any guys who shoulder the bulk of child-rearing. And yes, I’m also talking about penguins here. 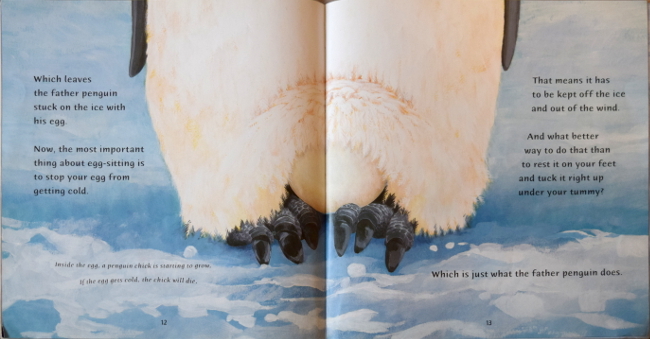 The Emperor’s Egg draws us into Antarctic family life from a male Emperor penguin’s point of view. After the female lays an egg, she disappears to feed all winter. The male warms, protects, and hatches the egg, then feeds the chick until the female finally returns to land. 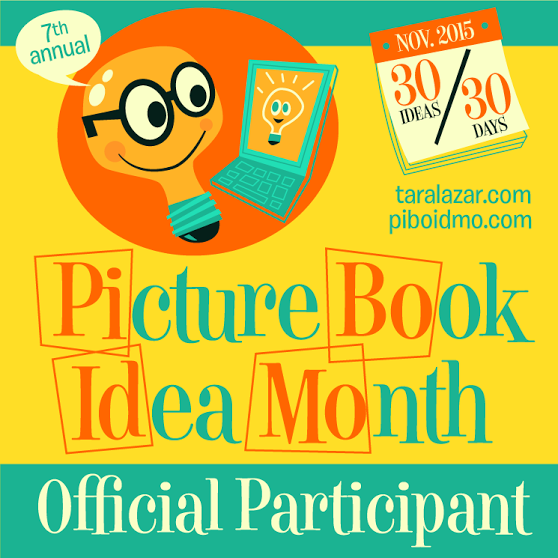 Stellar non-fiction picture books intertwine facts with emotion-evoking narrative. In The Emperor’s Egg, author Martin Jenkins slips in non-fiction tidbits while getting us to really care and root for the penguins. Illustrator Jane Chapman’s soothing acrylics capture charming penguin body language, while bringing life and depth to a barren landscape. Whatever your family situation, if you’re looking for a Father’s Day book that really embodies dad devotion, check out this gem. 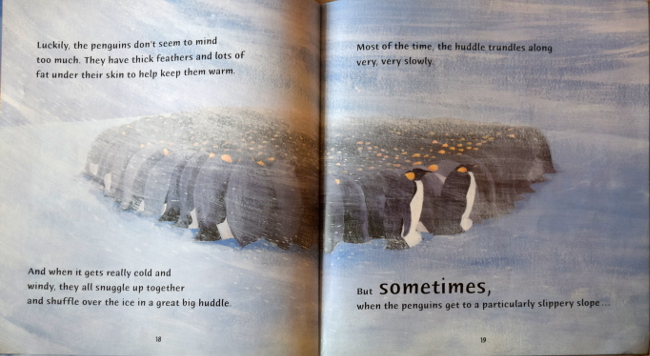 And when it gets really cold and windy, they all snuggle up together and shuffle over the ice in a great big huddle. THE EMPEROR’S EGG is an EGGcellent tribute to fatherhood; plainly stating the sacrifices that are made as the Emperor patriarch. I love how the narrative begins with the extremes of nature while the illustration portrays a simplistically painted landscape. 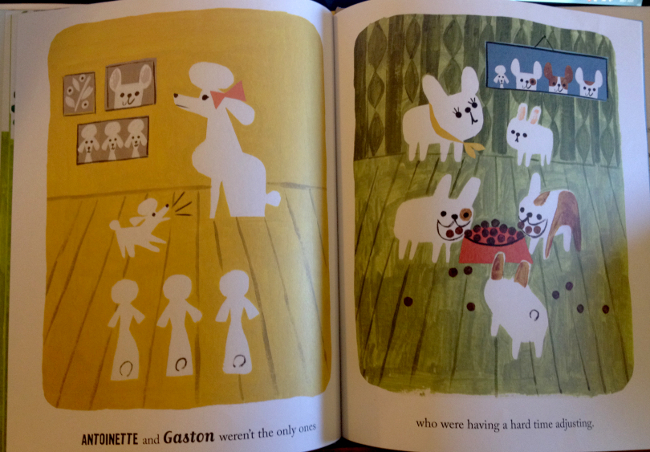 The illustrations are seemingly simple, yet masterfully rendered. Much like the extremes of the Arctic cold and starvation, the bold brushwork allows the onlooker to feel the heaviness of the dire situation. Then, CHIP, as though the sound of the newborn chips away the icy cold, the narrative and brushstroke’s shift and we are introduced to the feathery ways of parenting a penguin chick. This to me is a true picture book, as neither the narrative nor the illustration would behold such beauty, if it weren’t for the other. A true union that hatches a gem worthy of royalty. It’s mom! 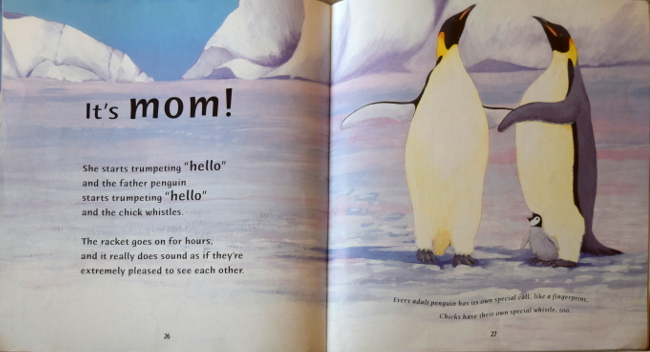 She starts trumpeting “hello” and the father penguin starts trumpeting “hello” and the chick whistles. The racket goes on for hours, and it really does sound as if they’re extremely pleased to see each other. There’s something special about waddling penguins, newborn babies, and doting dads. Martin Jenkins, author of Chameleons Are Cool and Grandma Elephant’s in Charge, combines them to add another irresistible animal-centered picture book to the Read and Wonder series. Through Jenkins’ enthusiastic and conversational writing style young and old readers will fall in love with the biggest penguins in the world. Their unconventional, gentle, and efficient tag team-style cooperation toward making a family offer subliminal inspiration to us humans as we strive for a higher level of selflessness and commitment. Jane Chapman’s lifelike illustrations and Jenkins’ clever footnotes pull the story together for an authentic nonfiction experience. 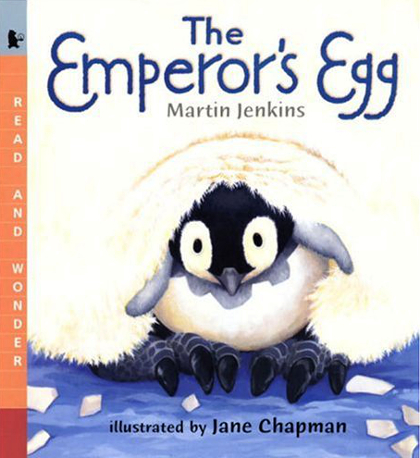 If you enjoyed National Geographic’s March of the Penguins, you’ll enjoy The Emporer’s Egg. Watch for my pick next! 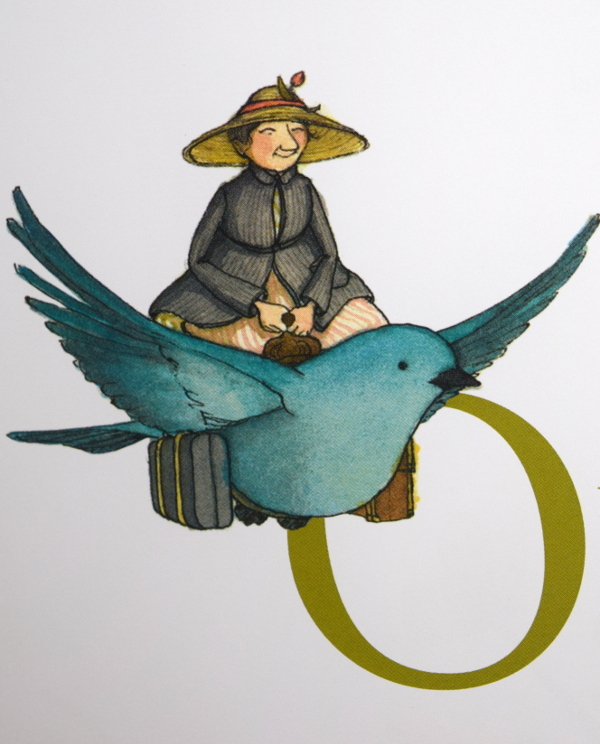 In Miss Maple’s Seeds, a sweet caretaker gathers lost and forgotten seeds, tenderly cares for them through the winter, and prepares them to set off on their own in the spring. Parents will certainly catch the poignancy here. 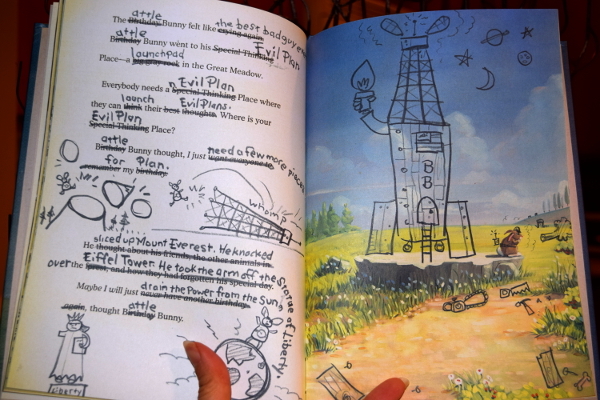 Young readers will love the illustration details showing how Miss Maple treasures each and every seed, and will turn the last page dreaming of their own marvelous futures. 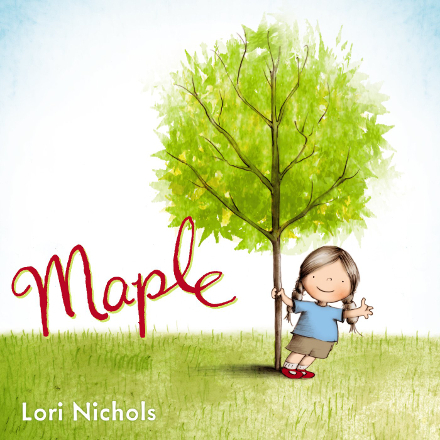 I ‘sneak’ this book into my science class under the guise of introducing seed variety and dispersal, and my first graders adore Miss Maple’s Seeds as much as I do. 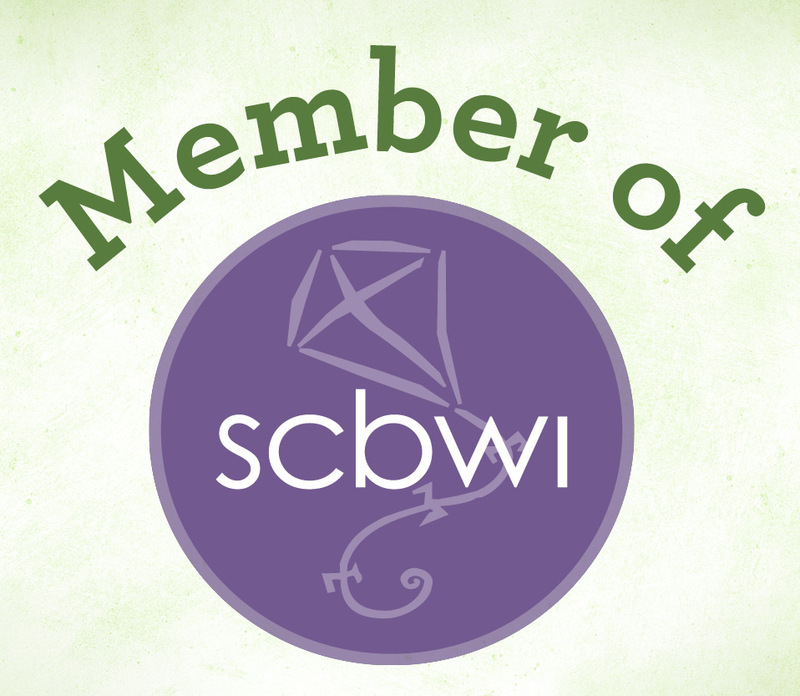 Bravo, Eliza Wheeler! 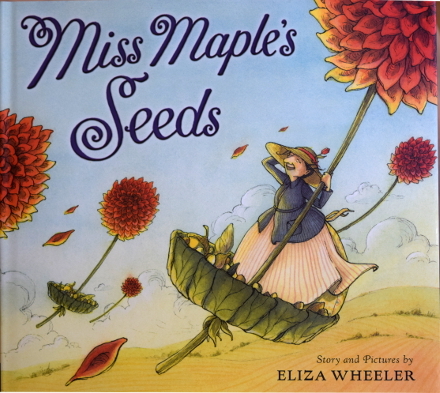 Throughout Miss Maple’s Seeds, Eliza Wheeler gently guides readers into picturesque settings and seasons to experience life as a tiny seed. Like a true parent, Miss Maple brings hope to her adoptive plant embryos as they dream of rich soil and warm sunshine. 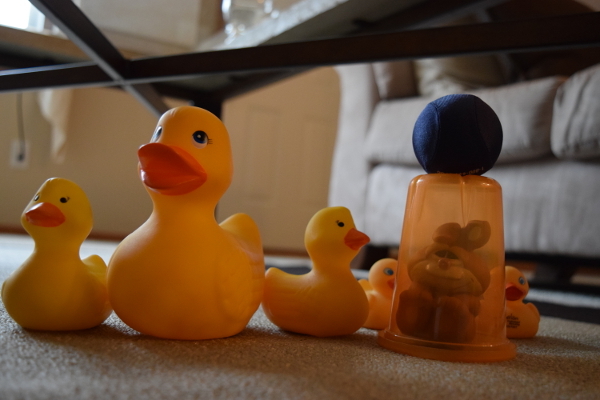 She warns them to “stay clear of weedy characters,” encourages them to dance in the rain, and when the time is right, she sets her infants free to take root. 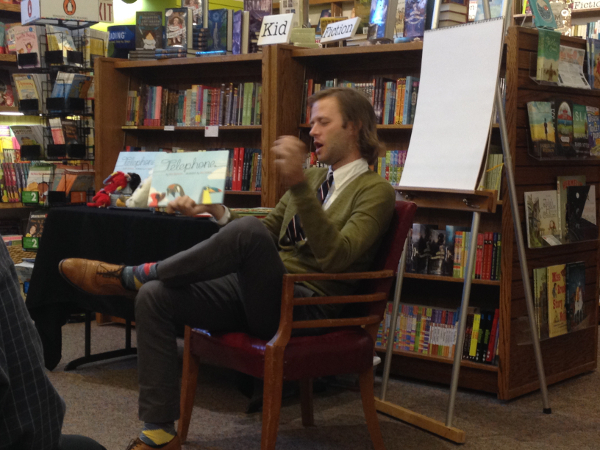 Wheeler’s quiet illustrations captivate. 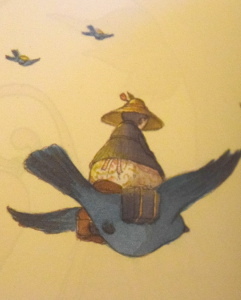 Soar on the back of a bluebird. Explore Miss Maple’s tree home. Let Eliza Wheeler nurture your curious mind. What children’s book make you think of planting seeds or spring? 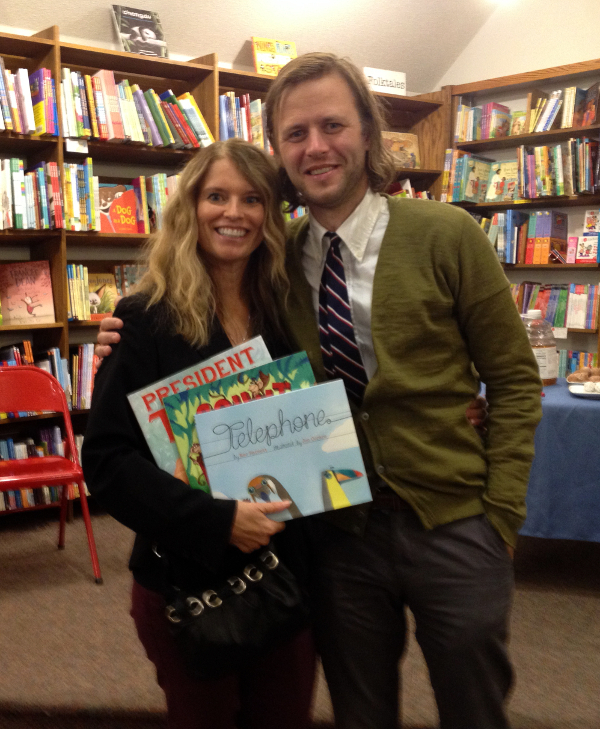 If you get the opportunity to meet Mac Barnett, read Battle Bunny first. Take it from me. I blew it. 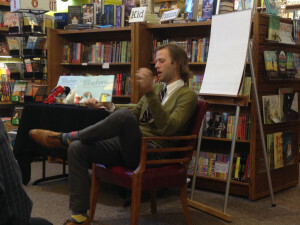 When Barnett visited the Red Balloon bookstore in my neighborhood I hadn’t read it yet. KEM friend, Elise, even pulled the book out of a Barnes and Noble book shelf and told me I’d like it. But I figured I’d look at it later. 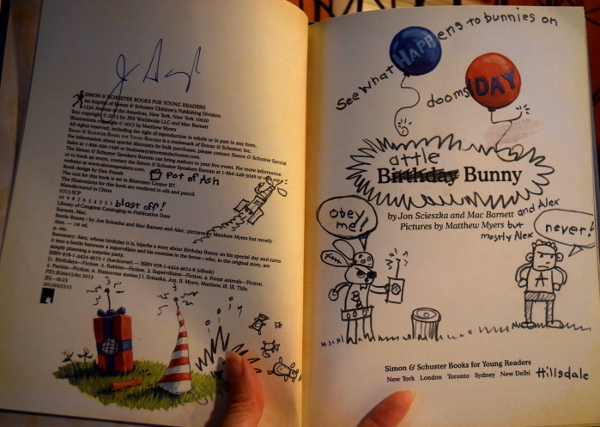 Now I’m thinking the only thing I would have liked better is an autographed copy of Battle Bunny and a chance to gush about it. Dang it. The strange-looking treasure is two books in one. 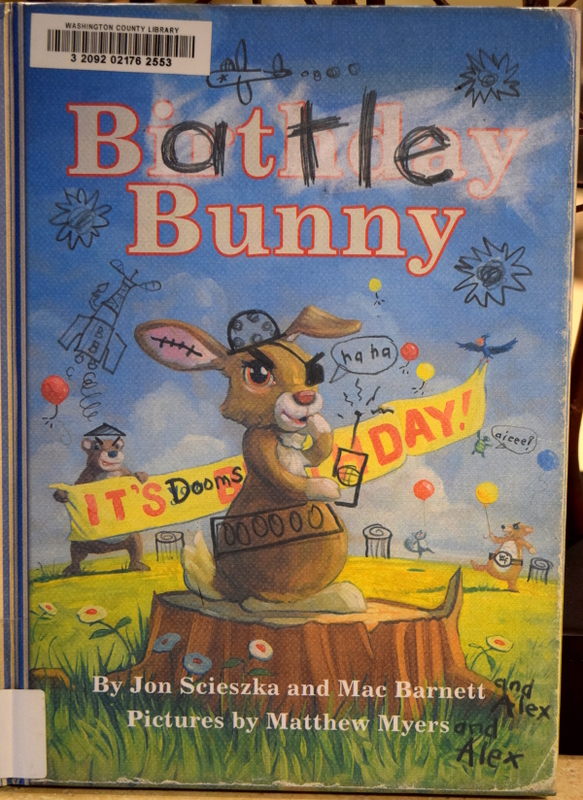 It began as Birthday Bunny, written by Jon Scieszka and Mac Barnett in the style of a syrupy, grandma-friendly Golden Book. Then it was given to protagonist Alex (Scieszka and Barnett’s alter ego) by who else, but his doting Gran Gran. 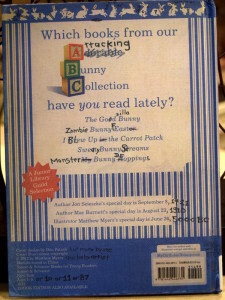 “Alex” transforms it into a disturbingly entertaining, testosterone-ridden, hare-raising tale of doom and destruction. (Alex’s artistic side comes compliments of Matthew Myers). The raw beauty of this book lurks in the details. 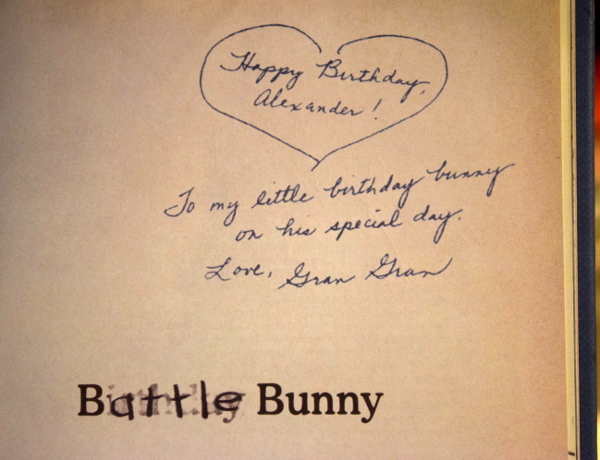 For instance, check out Gran Gran’s sentiments. 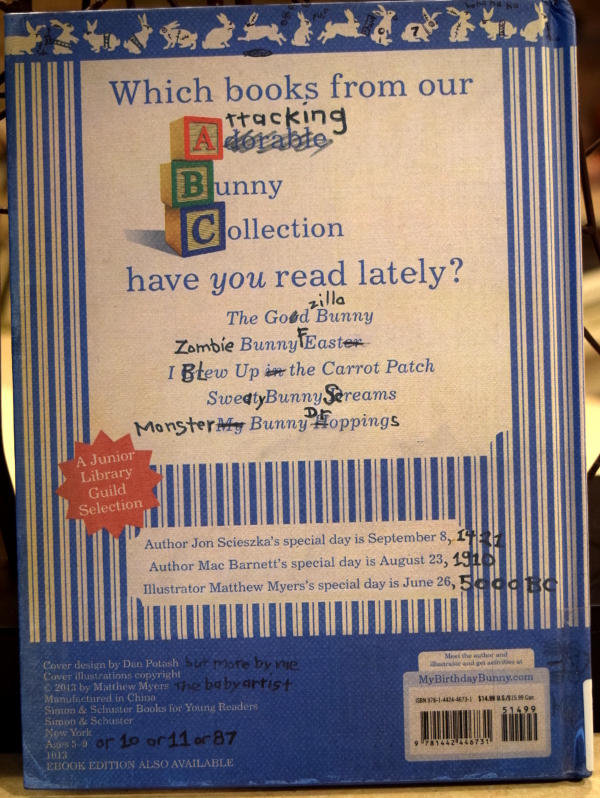 This note looks so real, I first assumed the library had a used book on their shelves. I can picture Alex gagging, choking, then gritting his teeth in response to his grandma’s saccharine birthday endearments. 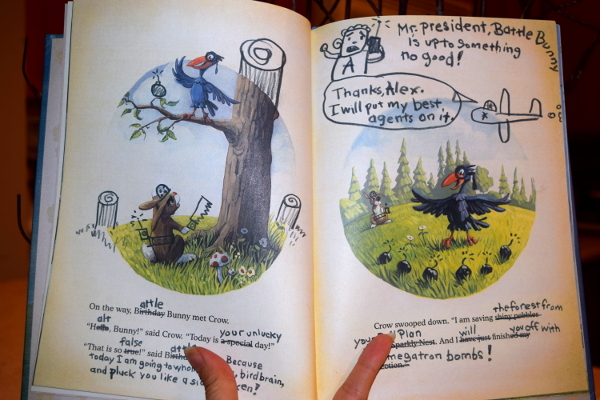 I’d type excerpts, but half the brilliance comes from “Alex’s” illustrations. 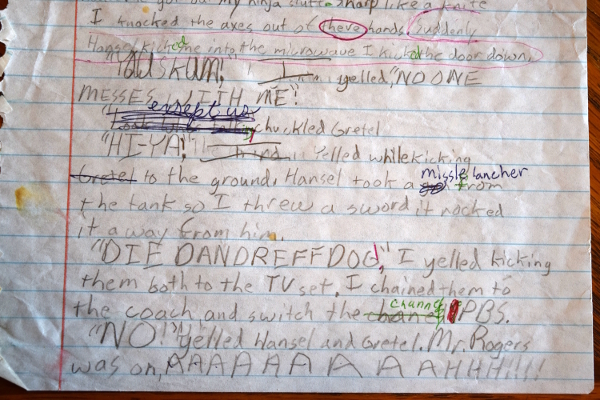 Our son wrote and drew BATTLE stories in grade school. We know this because of the calls to the principal’s office. The principal would run his hand over his face and suggest Ritalin. We’d try to look concerned, then save the confiscated manuscripts in scrapbooks. Luckily, Josh had a revolutionary teacher with revolutionary ideas about letting kids be kids. THE BEST STORY OF HANSEL AND GRETTEL Personally, I think the wrong family member creates children’s books. T’was a time when sheep smoked cigars and elephants had cars and there lived a gangster group called the devils. In that group was two of the baddest, the leader Hansel and his evil side kick Grettel. Hansel and Grettel went into the woods in their nuclear tank while they redecorated it with spray paint. When they were nearly done they saw a house full of candy. They spray painted it with black, green, and purple paint. Then they knocked it down with a silver battle axe. hen I glanced at brats wrecking her house, I got out my ninja stuff. Sharp like a knife I knocked the axes out of there hands. Suddenly Hansel kicked me into the microwave. I kicked the door down. “HI-YA!” I yelled while kicking Gretel to the ground. Hansel took a missile lancher from the tank so I threw a sword it nocked it away from him. “DIE DANDREFF DOG!” I yelled kicking them both to the TV set. I chained them to the couch and switched the channel to PBS. 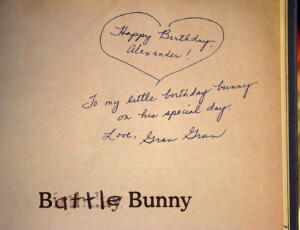 While reading Battle Bunny to children, one must read it first as originally written, then reread it Alex’s way. Our grandkids’ faces light up as they notice each detail and witness the unleashing of an imagination (Technically, three imaginations: Scieszka, Barnett, and Myer’s). When I looked under the coffee table, her request made perfect sense. 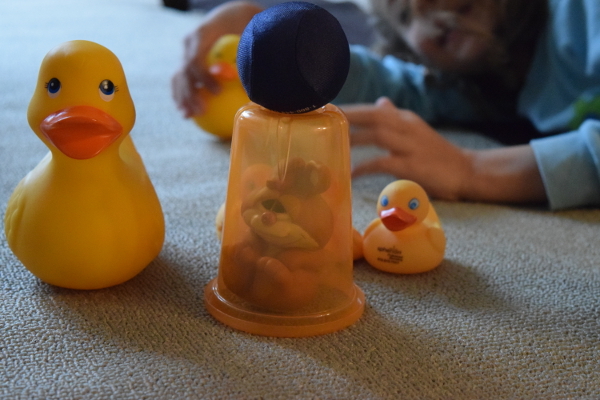 A rebel squeeze toy rabbit peered through his transparent plastic cup prison at an intimidating fleet of rubber ducky wardens. Gran Grans, Nanas, Grandmas–whatever you call yourself–UNITE! We owe it to our grandkids to supply each one of them with a copy of Battle Bunny (for inspiration), a box of markers, and a mushy Golden Book with a title page note from us urging them to go wild and re-create. I do hope their parents (and their school principals) will forgive us. 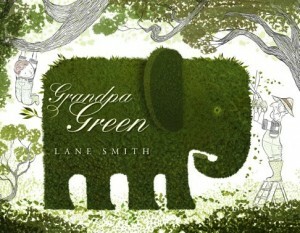 GRANDPA GREEN ornamentally grows our imagination, and creates a place like paradise. 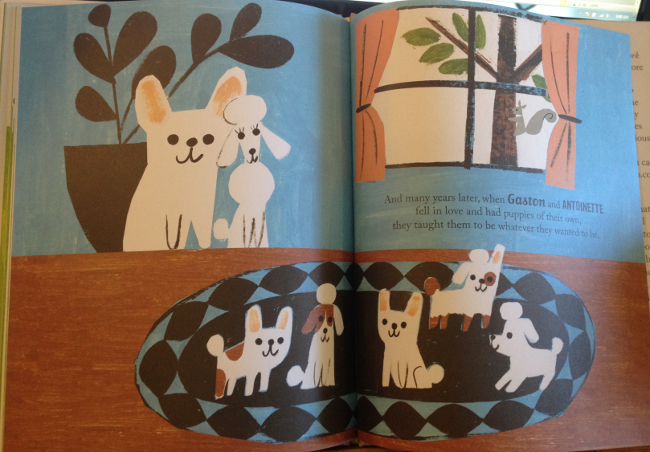 This quiet story dedicated to a grandparent derives its energy from the wonderfully clever illustrations. What makes GRANDPA GREEN standout from other sentimental picture books that chronicle a life are the clever, conflicted, laugh-and-cry moments; especially the ending. GRANDPA GREEN reminds both the young and the old that there’s a resolution to every problem, even the ones that seem the most unfortunate. Lane has created a masterpiece with humor and heART. Using an art form within an art form, Smith has done it again. His illustrations of topiary designs are brimming with texture, humor, and profound depth as they explore pieces of a fictional gardener’s biography. While some shapes are immediately apparent, I found I could not rush through this book. 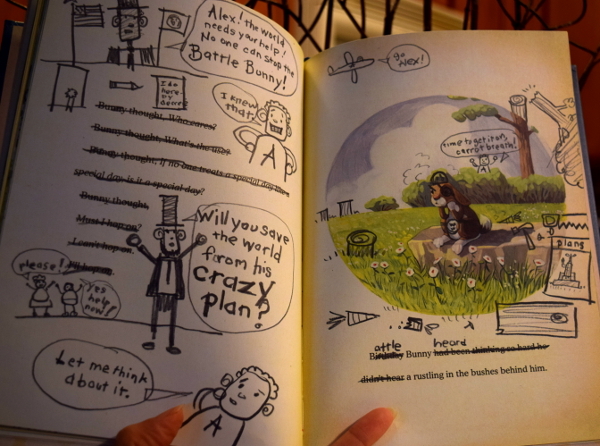 Each spread demands that the reader pause, or else risk missing a visual surprise. A dramatic four-page gatefold at the ends elaborately reviews the entire story of the gardener’s well-lived life. 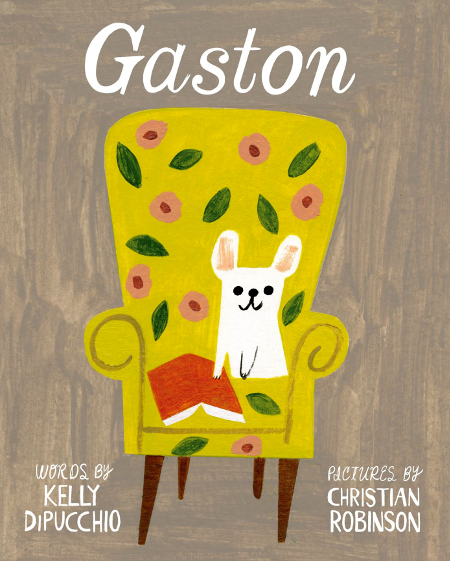 Smith’s quiet story explores a wide range of universal emotions, and undoubtedly sparks imagination and discussion across generations of readers. Wowee! Wow! Wow! 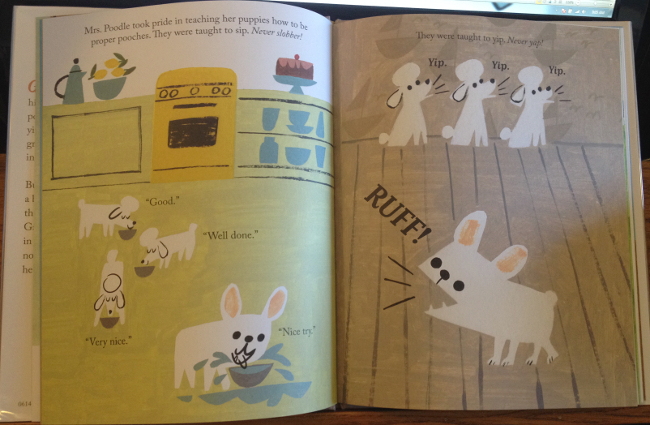 I want what Lane Smith eats for breakfast. Who else would have thought to narrate a story about a long and fulfilling life through a great-grandson’s guided topiary tour? Smith’s enigmatic illustrations and elegant silence drew me to one conclusion. Each page turn dazzled me with a new truth. GRANDPA GREEN covers the three “r’s” of relationship, reverence, and remembering. The Ancient Greek symbol of regeneration and rebirth, GREEN, provides the perfect color scheme for a book about the generational gift of life–and the ultimate last name for Great Grandpa. This timeless and gentle book will bless generations to our great-grandchildren and beyond. What do you like most about GRANDPA GREEN?